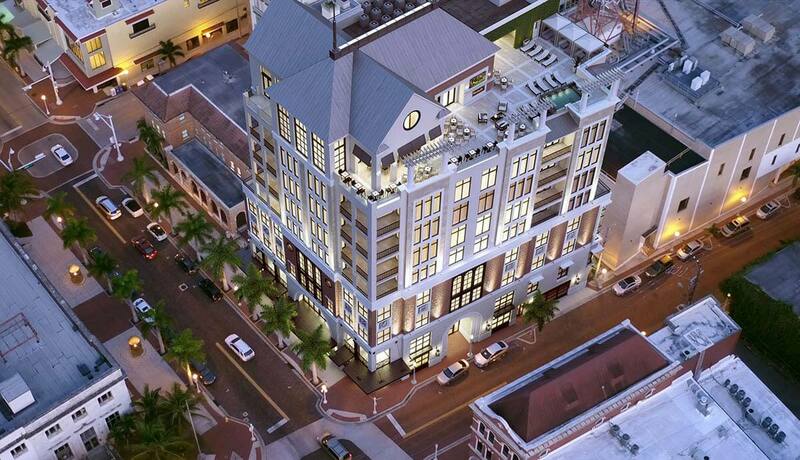 At The Place on First, a select few homes are available on the building’s private residential floors, levels 6-8, which are accessible by elevator or stairs. 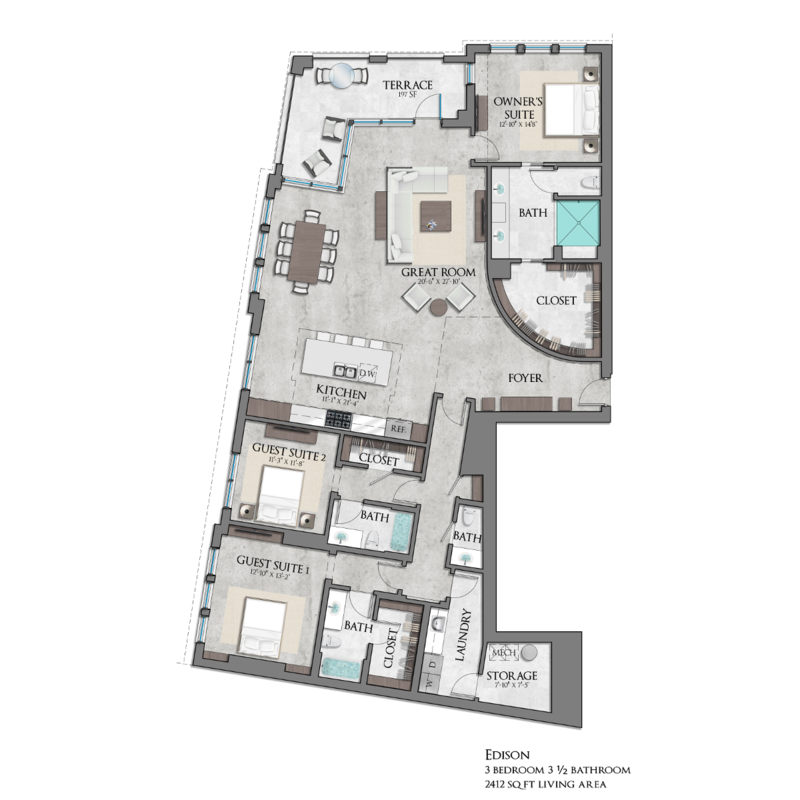 Each home includes access to luxury features including the ninth-floor Sky Terrace, grill area, fitness studio, bicycle storage, and state-of- the-art entry access. 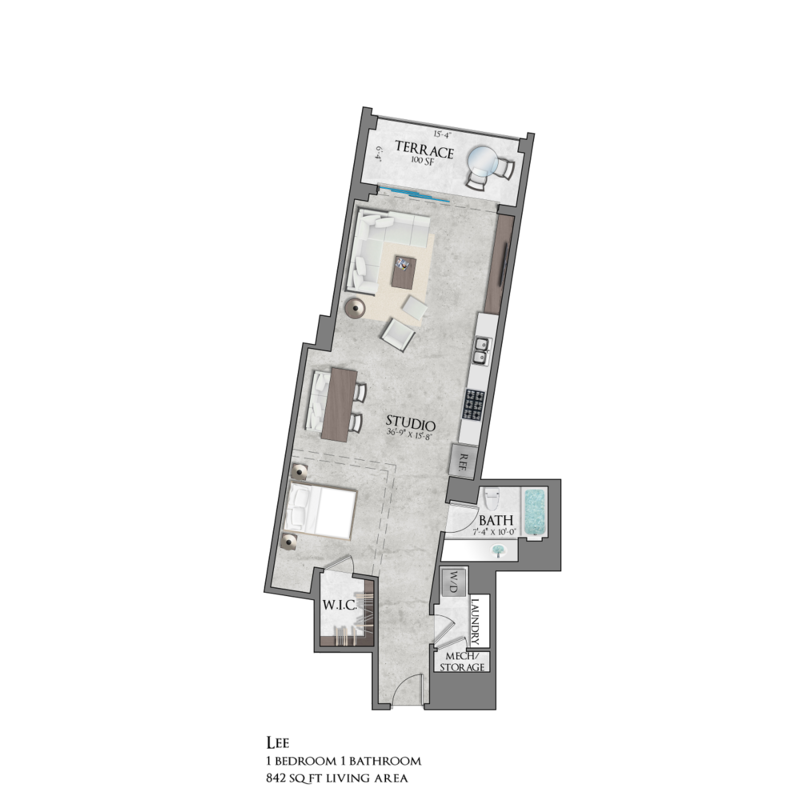 The most spacious floor plan at The Place on First, the Edison is pure genius. 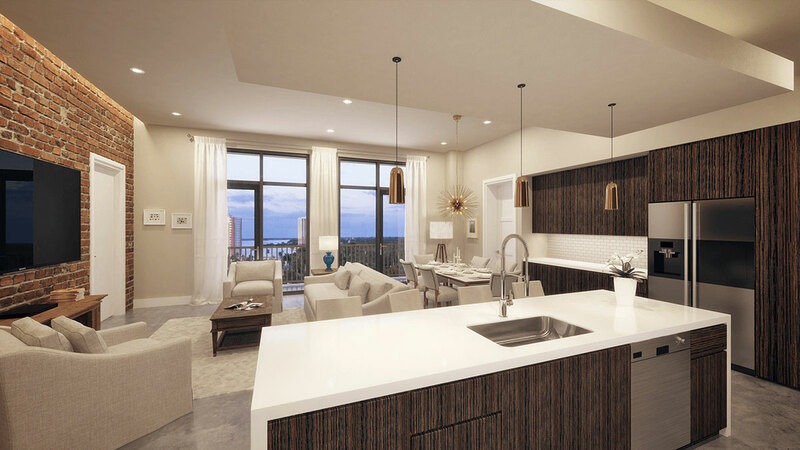 This open and inviting corner unit has a north and west-facing balcony displaying gorgeous river and city views, a well-appointed kitchen and comfortable living area. Urban style elements throughout the home, such as a brick accent wall and cove lighting are a part of the building’s unique design aesthetic. The owner’s suite also features river and city views, and a large walk-in closet. Two additional bedrooms enjoy city views, full bathrooms and closets. 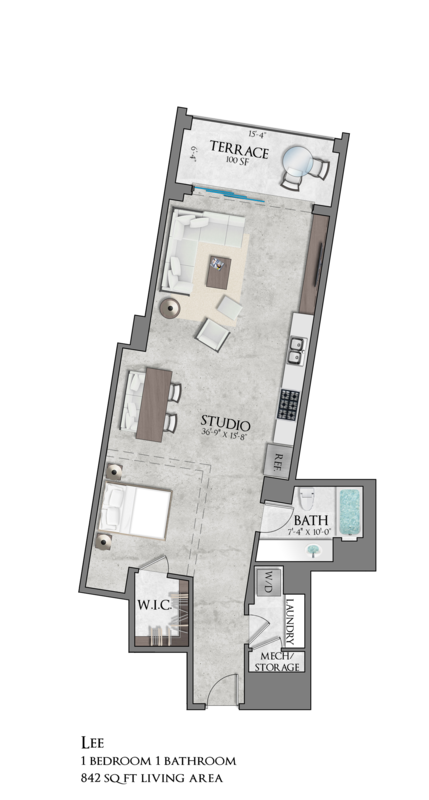 A laundry room and additional storage space complete this luxurious urban living space. 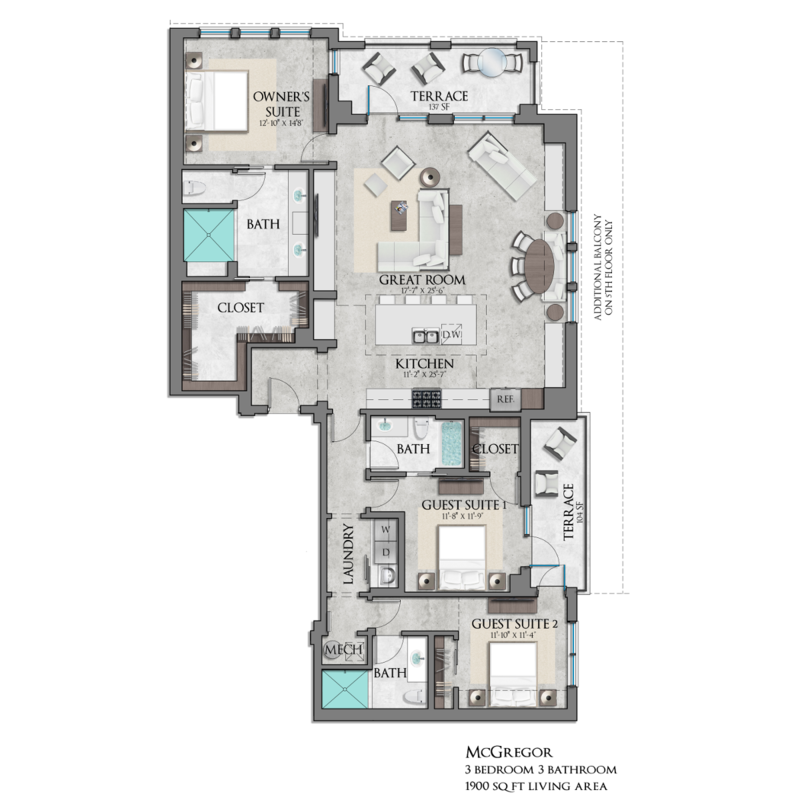 As iconic as the historic corridor that inspired its name, the McGregor is a corner unit with two balconies for an amazing urban experience. This 3-bedroom, 3-bath home has an open design with a spacious kitchen and living area that open to the First Street balcony. Urban style elements throughout the home, such as a brick accent wall and cove lighting are a part of the building’s unique design aesthetic. The owner’s’ suite also overlooks First Street and includes a large walk-in closet. 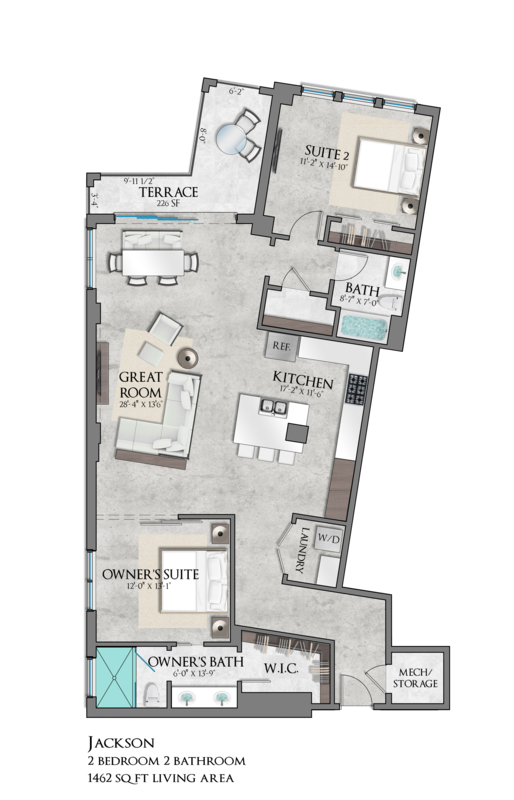 The second and third guest suites boast their own balcony with city views and each has a full bathroom and walk-in closet. 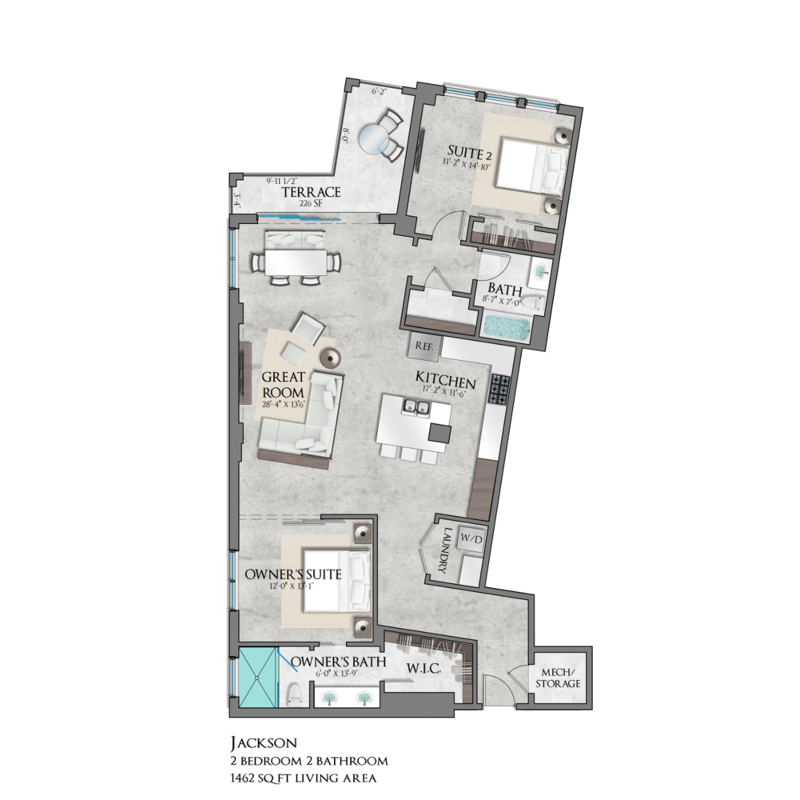 A presidential 2-bedroom, 2-bath design with a foyer, west-facing balcony and great room-style kitchen and living area, the Jackson is a revolutionary urban living space. 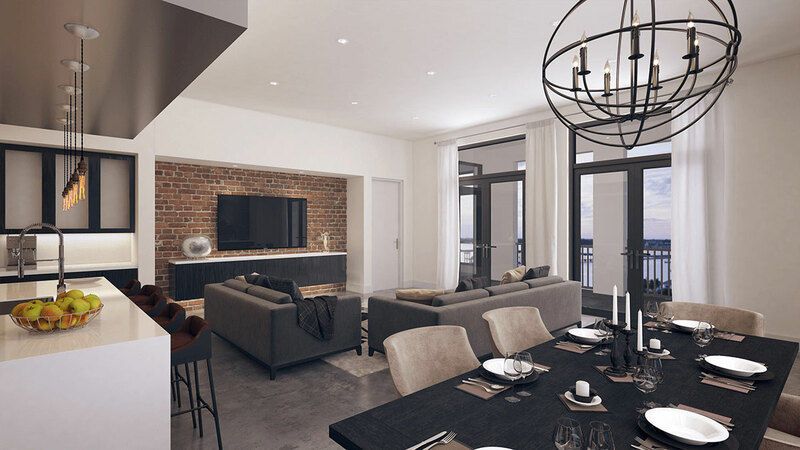 Urban style elements throughout the home, such as a brick accent wall and cove lighting are a part of the building’s unique design aesthetic. 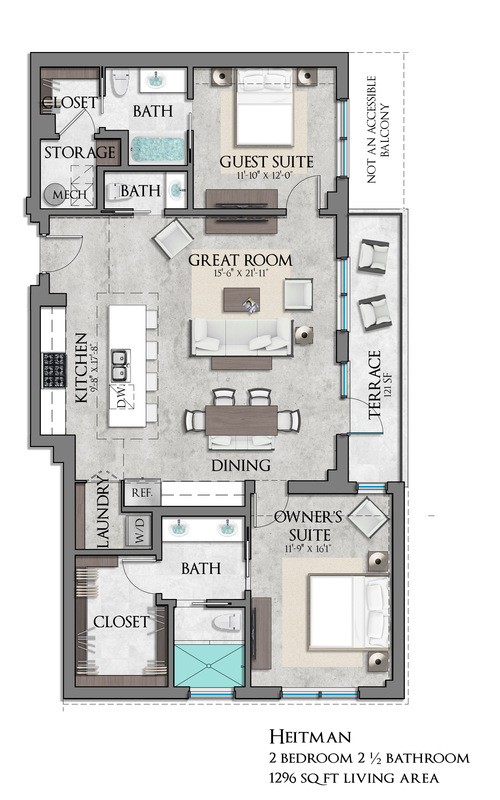 The owner’s’ suite features a large walk-in closet and full bath. The guest suite overlooks Jackson Street with city views. A laundry room and pantry complete the balance of this luxurious downtown home. 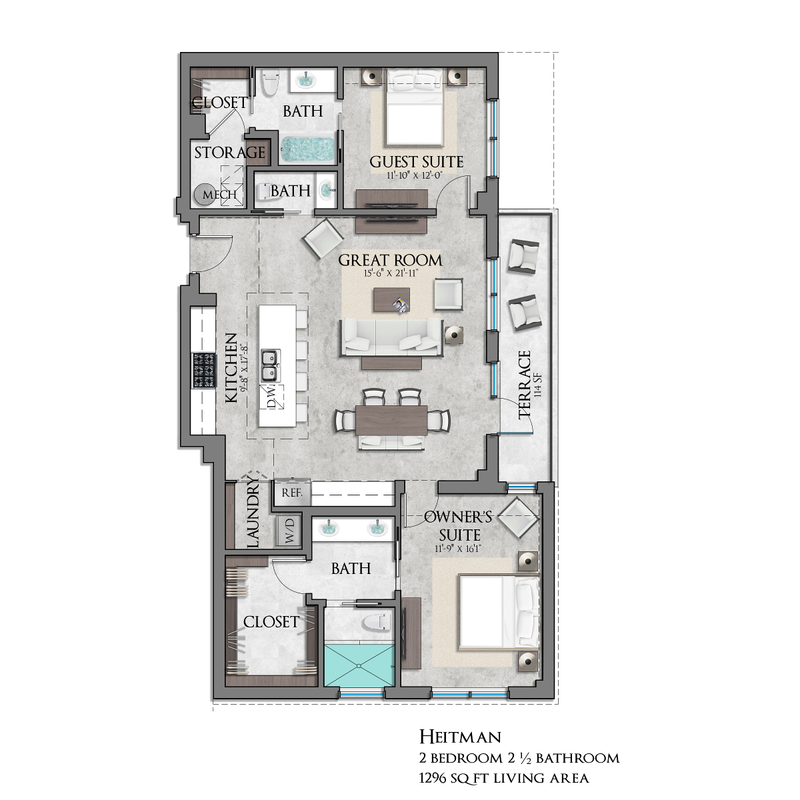 A split design open living concept with 2 bedrooms and 2 baths, the Heitman offers a balcony with a city view from the living area and state-of-the-art kitchen. 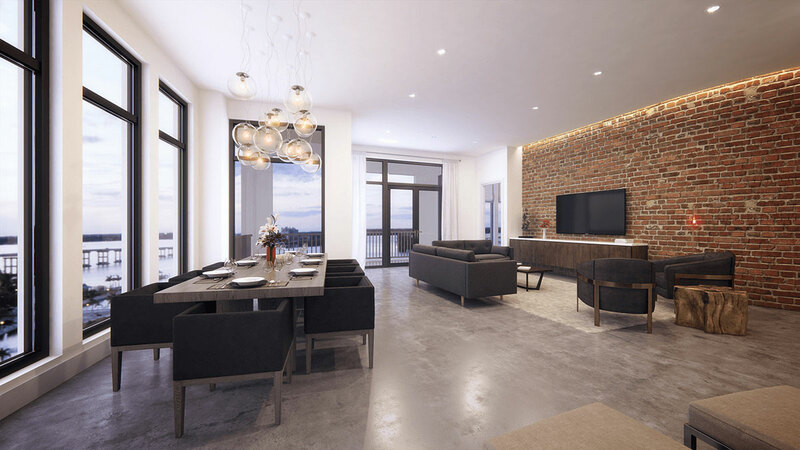 Urban style elements throughout the home, such as a brick accent wall and cove lighting are a part of the building’s unique design aesthetic. 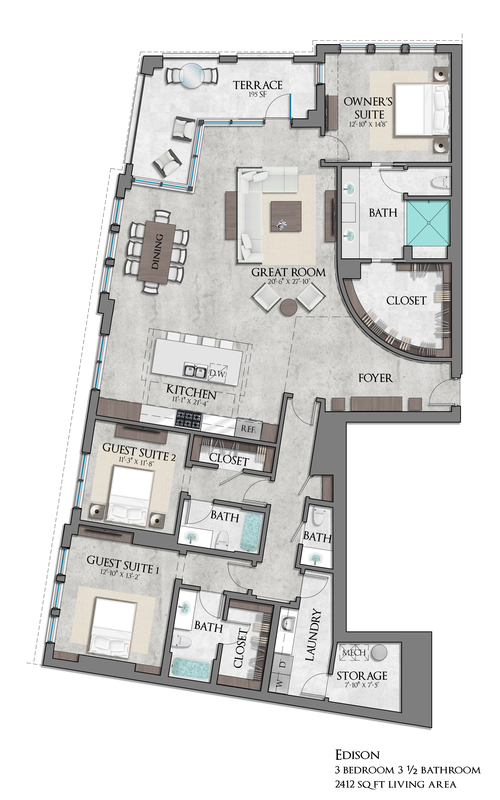 The owner’s suite features a full bath and a large walk-in closet. The guest suite also features a full bath and walk-in closet. A hidden laundry room and pantry complete the balance of this luxurious urban living space. Like something straight out of NYC, this studio apartment has a lofty urban vibe. A west-facing terrace provides exceptional views of Jackson Street from the open living area of this one-bedroom, one-bath residence. A full kitchen, walk-in closet and utility room complete the space. Urban style elements throughout the home, such as brick accent and cove lighting contribute to the home’s unique style. Plans are preliminary and subject to change without notice.